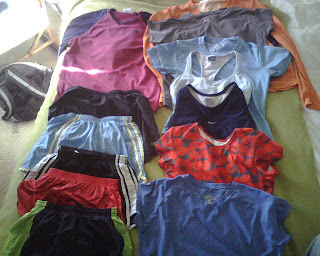 When I was a kid, I had my fair share of hand-me-downs. I’m the youngest of four. The baby. The spoiled one, so they say – the three older ones, of course. I didn’t always feel that way wearing my big sisters’ old clothes. I remember pleading my case in junior high, “But Mom that was in fashion nine years ago!” In retrospect, she was right. I still don’t share the same taste in clothes with my oldest sister, Sue, but I get a little giddy when Jane, the family fashionista, shows up with garbage bags of clothes for me to try on. Especially since she’s a runner, too. Here’s what she came by with recently. It gets even better. My big tri-sister Fe-lady sold me her “extra” wetsuit. 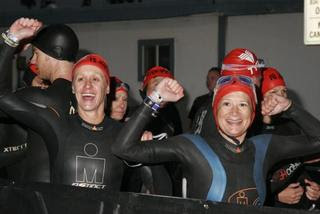 The one she wore at last year’s Oceanside 70.3 when she raced with me (pictured left.) My old wetsuit was getting too small. I guess I got bigger shoulders after three years of solid swimming. Last season, it usually took two people to muscle me into the thing. Fe-lady’s wetsuit? Fits like a glove! I got it on all by myself. It arrived gift-wrapped in pretty tissue and in perfect condition with a nice note of encouragement. It doesn’t even look like she ever peed in her wetsuit, but I bet if she did it would probably give me super powers. Thanks girl!